It has been a big week in my typewriter world. I started this blog, purchased two machines from eBay with mixed results, and decided to take one apart in my first attempt to repair a typewriter after it arriving inoperable due to shipping damage and poor packing. If that wasn't enough, I descended on an estate sale this weekend at the home of a former typewriter collector and a continuation of the estate sale at his office a month earlier. It was a bit messy and unclean, numerous signs of possible clinical hoarding. Most of his machines here needed some work unlike the ones I saw at his office which seemed to all function and had working ribbons, all 200 or so it seemed. This bunch looked like his to-be repaired batch. I could only imagine why this gentleman collected hundreds of typewriters. And I do believe there is a fine line between hoarding and collecting, and he bordered right on that line. I didn't really see myself a collector before, but perhaps it is the byproduct of looking for my perfect typing machine. Since there is no store like Best Buy to try all the models first hand, eBay, yard sales, estate sales, and thrift stores seem like the only means to come across them if you're lucky. It usually takes me a four or five pages in to know if I like that typer or not, so most of my review of the machine happens when I take it home and can sit down quietly with it and clack away. I quickly realized this process would take a while and discovered that I really couldn't let the "reviewed" machines go. I kept them around to compare to any newcomers that I may come across. It was fun and I got into it. I also loved physically hunting for typewriters around town over eBay mining (which I do plenty of too). I also enjoyed looking the machine and models up on the internet and discovered numerous scholarly resources which have provided endless joy and instruction. But as I start my first real repair, only having reconnected a carriage drawstring once on a Rocket, I wonder if this old collector did likewise. Perhaps it was his hobby to purchase old typers and fix them back up. The idea appealed to me and maybe this old ghost paid me a visit because I ended up adopting many of his typers, albeit still only a fraction. I purchased four on that day. I great haul IMO. Two I had been hunting for a while, a Hermes 3000, and Olivetti 32. Both have rave reviews on the internet of how well they type. I can't wait to give them a real sturdy test now that they are in my possession. But there was one standard typer that caught my eye all morning. It was underneath a table filled with portables and shoved way back against the wall, surrounded by three other heavy standard machines. I had already picked out four and thought I must pass on this. I don't need another standard since I own two. But I had to check it out. I knelt down and pulled this machine from under the table into the dim light that was available. It was a heavy bugger. I examined it. It was fairly dirty and had cosmetic damage. That decides it, I thought. I only buy functioning machines with decent cosmetics. I typed on it and it was a bit sluggish. There was paint discoloration on one side. I rejected it and put it back underneath the table against the wall. I left the sale and came home to give the newly bought machines a cursory clean. I was happy to obtain two on my wish list. But after surfing the internet in the last month, I had discovered a machine I had never seen before on Richard P's Writing Ball, the Lexikon 80. I thought it was beautiful and it immediately rose to become my dream machine since I had gotten into desktop standards this year. So it killed me that I walked away. I slept on it and the next morning I decided that I should go back and see if it was still there. If I was spending the time repairing a clunker right now, why not try on one that you like. I seem to be enjoying the process so far. Besides, if it was still there, then it was meant to be. And low and behold, it was. I didn't think I would find this machine so quickly having only learned about it last month, but serendipity struck again. 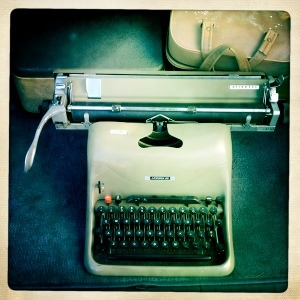 I've had a few such occurrences ever since I started hunting for typewriters which I'll blog about another time. I'm very happy I got this machine. It's one of my pride and joys now, but it needs quite a bit of work still, but hopefully I'll be ready for it when I get to it!